These beetroot and chocolate cupcakes went down a storm at a bring-and-share lunch on Saturday. I found the recipe on the Ooffoo website after posting up my spinach and aubergine lasagne last month. 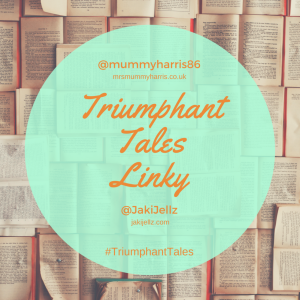 The funny thing is that the muffin recipe was posted by Mrs Green, a name you may recognise from comments on my blog, whose My Zero Waste blog chronicles her families commitment to recycling and reducing their household waste. Discovering one of Mrs Green’s recipes was like bumping into an old friend and since the last of my allotment beets were also looking ‘sad‘ in the bottom of the fridge I decided to give the muffins a try. My beets had been destined for soup but to be honest I was quite relieved to find an alternative – I can’t can’t quite get my head, or stomach, round the idea of hot purple slurp. They certainly won’t be left languishing so long next time and this recipe would be ideal for using up those larger, tougher beetroots that often end up on the compost heap. Sift the flour (and cocoa powder if using) into a bowl and add the sugar and raisins. Mix well. In a separate bowl, whisk the eggs into the oil. Add the cooked beetroot and mix well. Add the wet ingredients to the dry ingredients and mix everything together lightly. 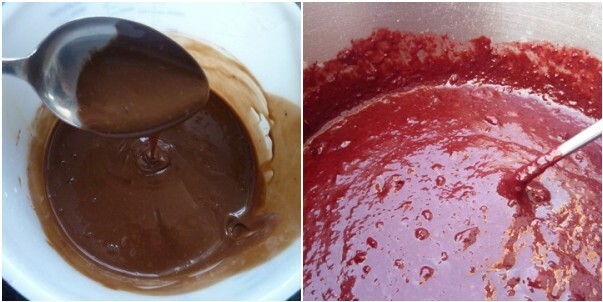 Spoon the mix into muffin cases or cake tins and bake for 20-25 minutes until brown and risen. ps. …about that 9” cake. I was going to embark on my maiden freezing of baked goods but having given all the cupcakes away it was the least I could do to let George have the cake! They look delicious and fluffy, no wonder they all went. and a great way of sneakin’ some goodness in there ! Oh my goodness! I have been scrolling through all of your wonderful posts, and now my mouth is watering! Wow!!!!! I need to catch up on your blog! Chocolate AND beetroot together !!! I/We are not convinced on that one. One day I might……. 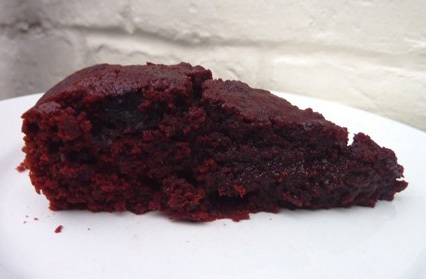 A friend of my requested a beetroot recipe recipe and i was going to make HFW beetroot and chocolate cake, but I may change my mind and make these as they are portable. They look deep and delicious. I will also check out Mrs Greens blog, sounds good to me. Thanks. Oh I had to come back and say ‘so glad you didn’t make soup’. I really don’t like beetroot soup. Those look good, and healthy too! I’m not really a beetroot fan but if there’s chocolate in them….! Miss M – i reckon it would work with carrots and courgette too! Rufus – you wouldn’t know the beetroot is there. I understand your reluctance since you don’t really like beetroot anyway! Nic – yep they’re definitely both. I’ve just made your chocolate christmas puddings, they’re delicious and I’m trying hard not to pilfer any before my family come over later! 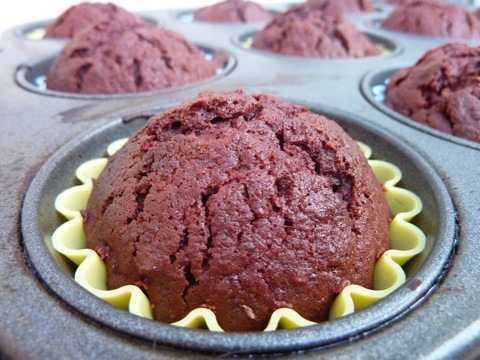 I love the idea of using beets in a muffin. It’s one way of getting more veggies. I must try these. You’ve been very busy cooking up all that wonderful Cretan food – my sweet tooth loves Backlava, my green tooth loves green beans in tomato sauce and my skinny tooth can never tires of Greek salad. oooh – these were delicious! Nice and moist – and not overly sweet. Very chocolatey! THANKS! Just made a batch and gosh they are lovely. In taste similar to mud cake. Not too sweet which is plus. Thank you for the great recipe not only great on taste but also such a pleasure for the eye. it’s warming up here now so perhaps when the snow comes in again next winter (as it’s bound to) I will finally give beetroot soup a try. 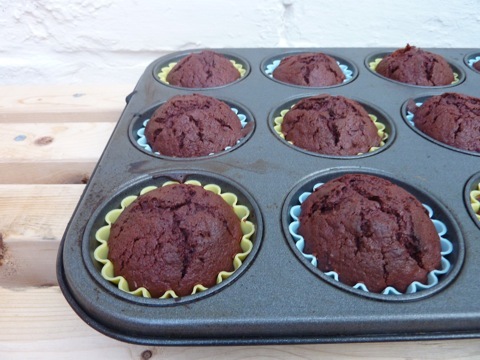 Thank you for the Beetroot Muffin recipe – over the past 2 years I have made Beetroot Chocolate cakes, fudge and muffins from lots of sources and this one is much my favourite. Its on the ‘permanent’ list ! I love baking with garden veg. smashing Sue, always lovely to hear feedback.